Disk shaped beads, sequins are great for all craft projects and can be used to decorate and embellish a whole host of things including clothing, jewellery, cards and scrapbooks. Using sequins within your project couldn’t be simpler, there are loads of ways to apply them to your design such as sewing on as a trim or as singular sequins, sticking on with glue or scattering. The size and shape of the sequins used will depend on the project; lighter weight sequins and trims are best used on clothing for successful continued washing and to reduce the pull on the fabric, in contrast heavier sequins are best used for static craft projects and jewellery creations. Choosing the right kind of sequin is key because the weight is a huge factor that decides whether the project will hold together without falling apart but with some many different types of sequins available how do you know which to use for what project? For costumes and fashion use an elasticated sequin trim, sparkle and movement combined without the need to sew individual sequins on – always a winner! Flat and loose sequins are ideal for embellishing fashion items such as that little black dress that needs a little lift, craft projects and some soft furnishings. 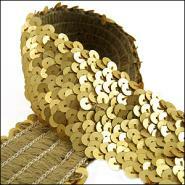 Strung sequins work well in craft and furnishing projects as does the non-elasticated range. Be sure to choose the right fixing element for the sequins, and the material you are fixing them to, in order to prolong the life of your creation. When using sequins for trimming, making jewellery or adding to handbags be sure to use a high quality thread or elastic to ensure the risk of the thread snapping is minimal. For craft projects use good strong glue to fix securely. We all know kids love to craft and the JosyRose range includes some great novelty sequins that are perfect for creating Christmas cards and using on all of the projects kid’s love to do as they get older. JosyRose online haberdashery is proud to offer the most extensive online sequin range in Europe and even prouder that all of the sequins are manufactured in London. Available in a great range of shapes, sizes and colours it is guaranteed that there is a sequin design within the JosyRose range that will be perfect for your project at a price you can afford. So what are you waiting for? Go sequin crazy!